We are looking for highly motivated, dedicated individuals to join our team! 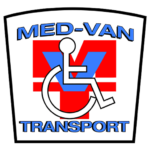 Med-Van Transport is a Non-Emergency Transport Service with specially equipped vehicles. We are able to transport patients by wheelchair or stretcher. Services are available anytime day or night and we will accommodate your individual needs. Our drivers are all trained professionals consisting of Paramedics, EMTs, and other health professionals. Our staff will do all the work for you and return you safely home when finished. All services are available 24 hours a day. Transport to and from all medical destinations and we can also accommodate special requests on a case by case basis. Need a quote for transportation? Submit your request online, call us or print and fax this form to (814)-948-6184. We offer ALS /BLS Ambulance Transport, Wheelchair Van Transport, Station Car Transport, Training Classes and more! Located in Northern Cambria, Pennsylvania; we provide a full range of transportation services all across the state and beyond. We're hiring! EMRs, EMTs, Paramedics, and Drivers. Competitive Wages, Vacation / Sick Time, Health Insurance and Uniforms. No Matter When, No Matter Where, Med-Van is There!